Shawl collars are cozy to wear and simple to knit, and Ketch will keep you warm whatever the weather. 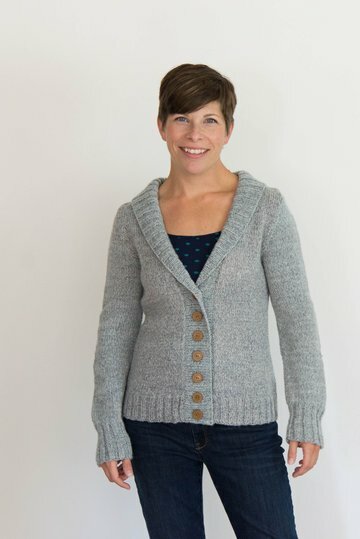 Worked with simple 2x2 ribbed trim, this basic cardigan makes a versatile wardrobe piece that is the epitome of sweater. Jackie is wearing the sample in a relaxed fit. The sample for Ketch was worked in Lorna's Laces Masham in the color "Dobson". We love Masham for its beautiful marled look, warm, soft hand, and its quick-to-knit gauge. Amy got a gauge of 4.5 stitches to the inch and absolutely loves the fabric it creates.